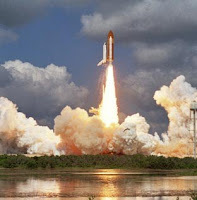 ONLY TWO SPACE SHUTTLE LAUNCHES LEFT!!! That's right! Just two more chances to view a space shuttle launch before the program is history! Why not pack up the RV and plan a short vacation to Florida's Space Coast! We have extended our special off-season rate for just this occasion - Stay 2 nights at $40/night, get the third night free. The Great Outdoors is rated a perfect 10-10-10 by TrailerLife and MotorHome magazines as well as a perfect 5W by Woodalls, and features such amenities as 30/50 amp service with full hookups on level concrete pads, 18-hole championship golf course, free cable tv, 2 pools, on-site restaurants and much, much more! So check out these dates and start planning this truly once-in-a-lifetime RV vacation - just remember to make your reservations now by calling 800-621-2267 in insure your RV site! November 2, 2010 Discovery 4:17 p.m.